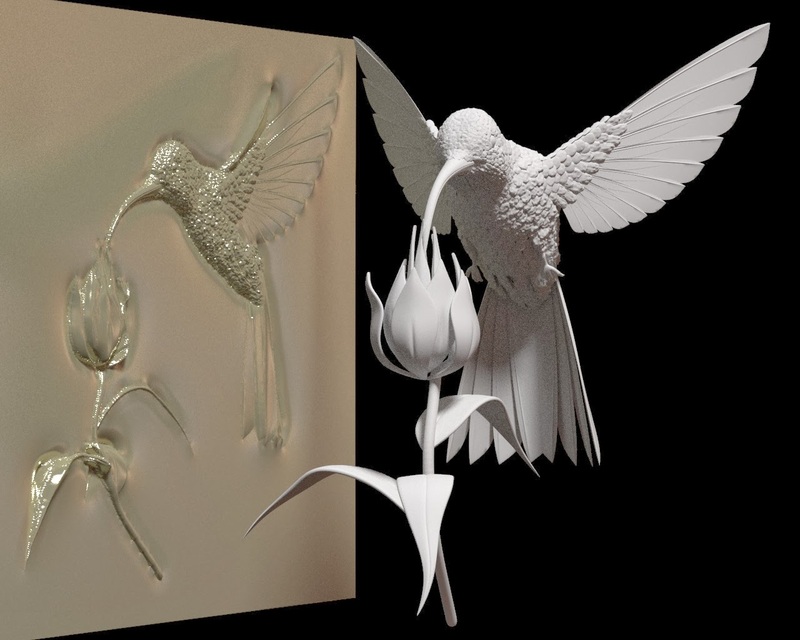 Bas relief addon enables you to convert your 3d scene into a bas relief that can be milled with an 3-axis cnc machine. I use this algorithm for all my bas-relief work, which can be seen in the gallery. The addon is distributed with documentation,tutorial and sample file. I hope users of blender CAM will find this addon usefull, since it's especially good for purposes of CNC milling. This addon will work with Blender CAM installation or any blander which has Numpy library built-in. Best way to use it is to download blender CAM, unpack it, then follow the tutorial. I put a lot of efforts into this algorithm to work well and it's a unique combination of this algorithm which cannot be found in any other software package, and also delivers better results than my old bas relief node patch for blender. It was optimized for good quality output. I recoded this algorithm from scratch in python, the only prerequisite is numpy, which is distributed with Blender CAM too. I will make donation soon! Interesting! I What kind of machine code does it write ? I have a Heidnhain controller ( CNC ). Blender CAM has support for many machines, It uses the BSD library from HeeksCNC. I am not sure if anybody allready tested it with a Heidnhain machine. You can download blender CAM from the download page. Bas relief addon is only for conversion of 3d scenes to depth relief images. A few typos, but no email address to send them too. Impressive work.... I want to build my own CNC router... unfortunately I don't have resources to do this.... for the moment.... Personally I like the "CNC USB CONTROLLER MK2" from planet-cnc.com. Is cheap and supports up to 9 axis! type of manufature like 3d printing? Are there details on using the addon or a tutorial? the depth image can be of course made into a mesh object, just for 3d printing you need to use an full object like a cube and use it for displacement. In the tutorial, there is how to use the addon and how to create a mesh object too. Besides that, there are sample files for all of this. Documetation is poor. Somepeople recomended me to use turtoiseSVN this did this situation even more complex. you DON'T need to build blender with this new addon. Old stuff was a patch which you had to build. This new is an addon. You download blender CAM build from this site from download page, + you get from me the link to this new addon after any donation you send. I will also opensource this addon after the donations reach 2000E, as I wrote in the article. just did a small donation to your project as much as my financial situation allows me. I have made donation but you did not email me the link for the bas relief add-on ? The edges around the model seem weird. It s like the shadows of the model affect the end result. Is their a way to keep only the alpha image and have a uniform background around the model through your plugin without using a program like photoshop. Your program is very cool. I will donate soon. Hello, did u get my reply? seems google started marking my replies to ppl as spam or something. Oh! It seems Paypal sent your reply to my other address. I did get it, thanks much!! I just donated. I can't wait to try it. If you donate, I will get an email from PayPal. I reply to this e-mail. Did you allready do some donation? If so, I didn't get the email. Hi, I just donated and can't wait to try this out :D I'm wondering what the current donation total is and also wondering what the current license is on this addon. Can I share it with my coworkers? We do some 3D printing and have been looking for a bas relief solution for a while. the donation level is now somewhere above of 1000 E allready, I have to do a sum of the donations. Regarding licesnsing, ehm, I am not sure currently, but it will be GPL after the donation leve. Several days have passed and still hoping to see a link? Is this project still active? Did I not contribute enough? I would be happy to send more if this is still active. Please try again. My spam filter blocked it. I've been using the addon for a while and I notice a slight issue. If an item has thin features in front of others, it adds the hidden rear detail to the visible one leaving an error of sorts in the relief which shows up as a lump. Is there any way to correct this? to see what you mean, I would actually need to see a file, because I don't understand your description really well. I posted a more detailed report on the google group. Did you get a chance to look it over? Do you need more detail? Great job you are doing ! Blender is my choice for 3D Bas Relief now that I finished making my new CNC machine. I just want to know how can I get this add-on. I made a small donation already. Thanks for your effort and support. Where can I find a tutorial for installing and using the basrelief addon? I have today donated 10 euro to your site. There are now good resolution dual lens cameras for say $500. From the two images, X,Y,Z can be calculated but I don't know how. Am I dreaming or could a bas relief be carved from this data? Please reply to podger.david@gmail.com. Most grateful for all your efforts to date. Hello, I'm making my firsts experiments with BlenderCam and my Shapeoko, and I'm interesting in your bassrelief addon, how I can get it?. I suposed that is making a donation.